Buy works – Orlovskii Vladimir Donatovich | (1842, Kiev – 1914, Italy). Orlovskii Vladimir Donatovich (1842, Kiev – 1914, Italy). Studied at the Academy of Arts under the supervision of A.P. Bogolubov. Painted sketches in Crimea, Kiev Region and Finland. 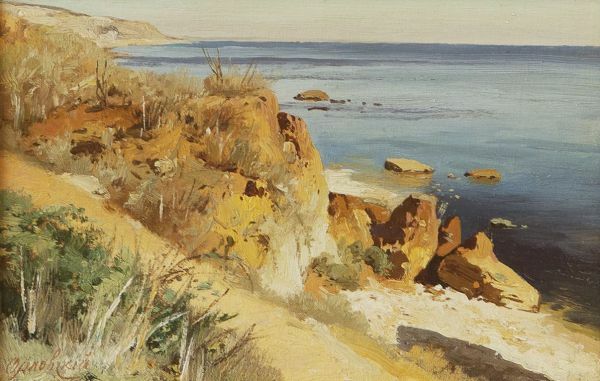 After he had been awarded a golden medal for his Crimean landscapes, Orlovski V.D. worked in Paris, Switzerland and Italy for three years. In 1878 was elected professor for his picture "Haymaking". Year – 1880s - 1890s. Signed lower left. Examination of the Center for Artistic Examination them. I.E. Repin. On a sunny day. On the river bank. 750000 - 900000 rub. 750000 - 900000 rub. Morning in the creek. Fishermen. 4500000 - 5500000 rub. 4500000 - 5500000 rub. 4300000 - 5500000 rub. 4300000 - 5500000 rub. View of Gurzuf and the Medved - mountain.